This report sets out some parameters for evaluating which providers you will want to look at as you make your decision to invest in new technology. Technology investment is a significant undertaking for any company regardless of your size or sophistication and our report provides a framework for identifying the best options for your business. We have conducted more than 30 in-depth interviews with the leading providers to help you understand each company's product offering and capabilities. With resources tight and frequently, expertise in short supply, this report and our consulting knowledge can help you ask the right questions and shorten your evaluation process. Time is money and no one wants to waste time and effort evaluating vendors which are not right for your business. 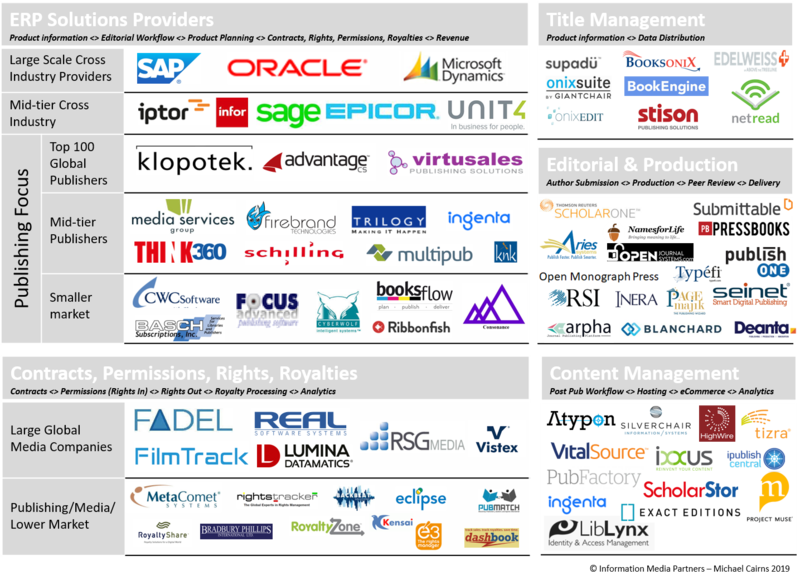 This software and services market place is under researched and our market map is unique in the way it identifies the primary providers to publishers and content owners. Several private equity firms have purchased this report to support their knowledge and understanding of this vibrant market place. This year we ranked Fadel (rights/royalties), Klopotek (Title, Editorial, Production) and Silverchair (Content Management) as the best positioned vendors in their segment having conducted over 30 interviews. 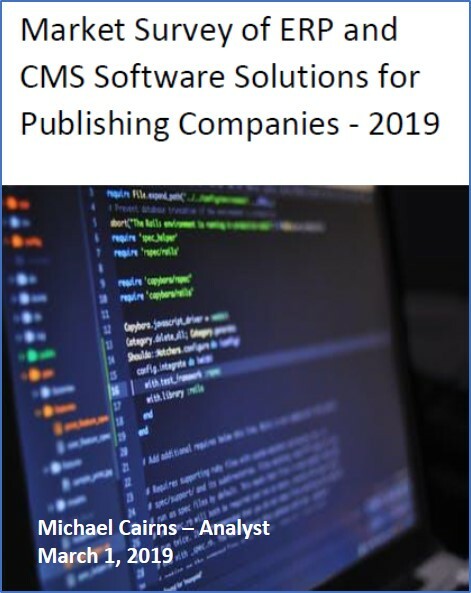 The 2019 report is 90 pages and includes a market overview, functional and technical descriptions of the primary software applications and vendors for enterprise resource planning (ERP), title, editorial and production (TEP), contracts, rights and royalties (CRR) and content management (CMS). We advise that you should purchase this report if you are considering any investment in technology in the coming year and/or if you want to understand the competitive environment for these products. As an added bonus, if you engage my company (Information Media Partners) for a consulting project in the coming year (not necessarily connected to this report) I will credit back the cost of this report. 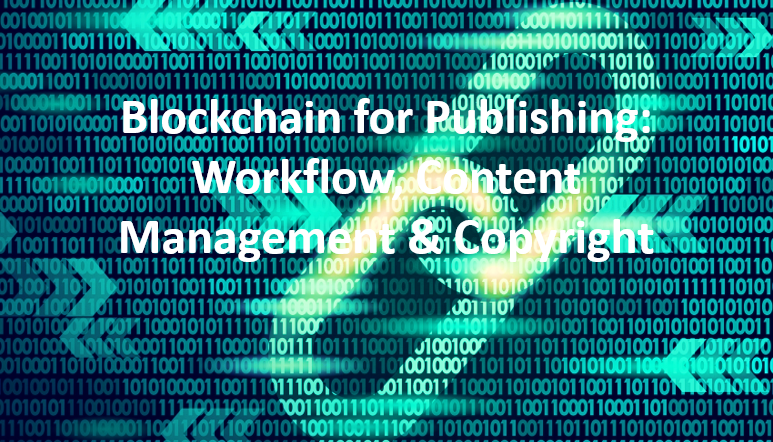 In close collaboration between Springer Nature and researchers from Goethe University Frankfurt/Main, a state-of-the-art algorithm, the so-called Beta Writer, was developed to select, consume and process relevant publications in this field from Springer Nature’s content platform SpringerLink. Based on this peer-reviewed and published content, the Beta Writer uses a similarity-based clustering routine to arrange the source documents into coherent chapters and sections. It then creates succinct summaries of the articles. The extracted quotes are referenced by hyperlinks which allow readers to further explore the original source documents. Automatically created introductions, table of contents and references facilitate the orientation within the book. AVAILABLE NOW This comprehensive report identifies over 100 software and services providers and reviews in detail more than 30 providers serving publishers of all types and sizes. In this report, we list the leading providers of financial & accounting, rights, contracts and royalties, product information, editorial and production management and content management solutions. If you are considering acquiring new software to manage key aspects of your business, it will give you specific and actionable information that will save you time and effort in your selection process (and may even prevent a costly mistake). Vendors will also benefit from our discussion of the current market competitors' strengths and weaknesses as well as developments in these sectors. Reed Elsevier, Wolters Kluwer, OCLC and others. Use this link to purchase the report: PURCHASE 2019 Report And see a full list of profiled companies. 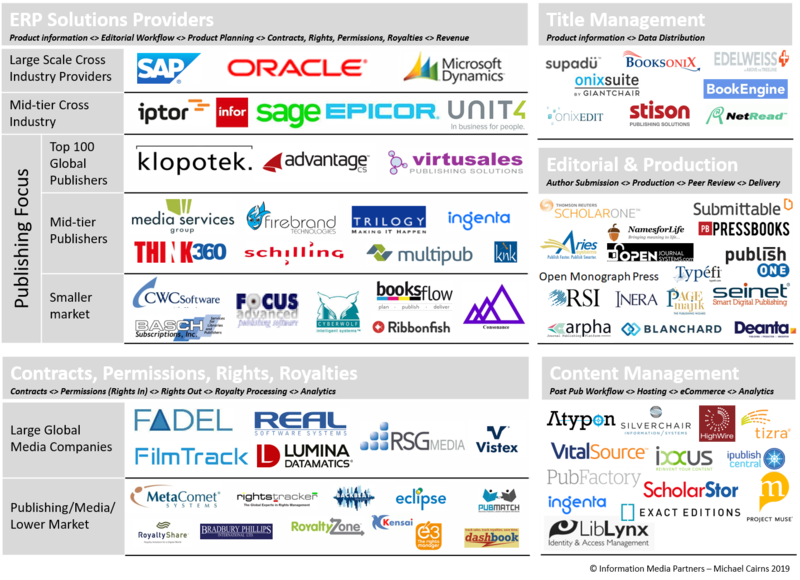 Market map of ERP, Title management, editorial and production and contract rights and royalties software companies. Companies profiled in this report included: AdvantageCS, Klopotek, Virtusales, FADEL, Filmtrack and many others. 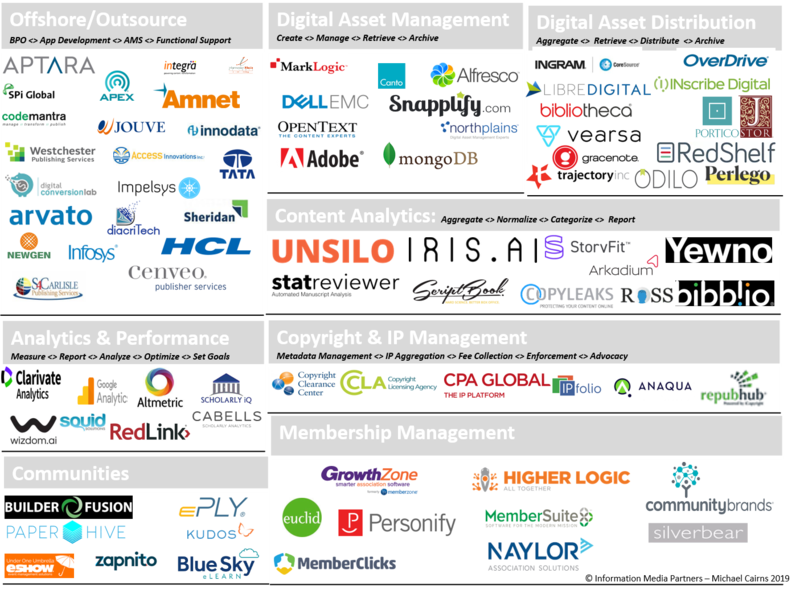 Market map of digital asset management, digital asset distribution, content analytics, copyright and IP management software and services companies. There’s a particular type of grime that accumulates on the soles of your slippers at Kings County Hospital. It’s black with a matted sheen-- no doubt from the accumulated grease and grunge covering the hallways and wards of this large metro hospital. You can’t really see this dirt on the floor but, when you carefully lift up your legs as you fall back into bed, you can see it on the bottom of your slippers. It’s disgusting. I thought they gave me the slippers to keep my toes warm but it was really to keep them clean. The hospital ward is filled to capacity. Starting at around 6:30 in the morning, four or five TVs click on and compete in a multinational mash-up of languages and programming. One is a ‘house’ television located so high up on a wall it’s impossible to see clearly – and no one seems able to change the channel anyway. The din continues all day. I’m flanked by two new-found friends, but we have nothing in common except violence. I am clearly an outsider in this ward. The guy on my left is in his mid-twenties, a little younger than I. He’s here for a minor gunshot wound-- if there is such a thing – sustained when he was mugged for “a quarter and a subway token.” We were together in Kings County for five days, but I never saw anyone visit him. The guy to my right is slightly more gregarious. I never found out why he was in the hospital but he keeps telling anyone who will listen that he’s convinced he has HIV. There doesn’t appear to be any reason to believe it—it’s the eighties and the doctors and nurses treat him no differently than anyone else. We have some curious conversations over the course of my week-long stay but none I remember clearly. One occasion I do remember: He has the curtain around his bed drawn—possibly because I am attended by an animated nurse telling me a story. In her excitement, she waves her arms around and hits my neighbor through the curtain right across the bridge of his nose. We hear a muted “ouch”. It’s like a scene from the movie Airplane! It’s relatively rare in life to be completely transported outside your normal, predictable existence. It happens when you travel to countries where you are a true outsider, and that’s what makes travel fun. But to be transported to a completely different world just miles from your own home is more than disconcerting—it’s scary, confusing and, in my case, very depressing. When I was brought up to this ward at 4 am on a Saturday morning, I was still in Brooklyn but it was a foreign country: There was a gurney parked near the door flanked by cops. On it was a patient handcuffed to the side rails. I started to refer to this as the prison hospital. The day before had been the end of my first week of work at Macmillan, Inc.--March 17, 1989. It wasn’t late--around 9pm--and I was almost home. Someone grabbed me from behind, stole my briefcase and stabbed me in the leg. He did it deliberately – he stepped in closer to me, reached around and knifed my quad through my coat. He had no need to do this whatsoever. I’d been in New York since late 1988, sleeping on a friend’s couch and looking for a job but I’d finally landed a great position and had moved in to this apartment three weeks earlier. Direct deposit hadn’t yet been set up and my first week’s paycheck was in my wallet--now gone. But that was the least of my worries: I managed to make it to my apartment building and walk up the steps, but collapsed in the lobby as my blood pressure dropped like a rock. Before blacking out, I had time to tell the super to call an ambulance. When he asked why, I just looked down and we both watched my blood pool around my shoes. I recall very little else until I woke up in the ER later that night. I have a sketchy recollection of the EMS crew trying to wake me up in the ambulance but, other than that, nothing. Until I awakened to find myself in a large room with more than 30 gurneys haphazardly pressed together. By this time it was around 11 pm on a Friday night in an emergency room in Brooklyn—what I suspect is “show time.” In the room near me, one large muscular victim was attended by two overly made-up ladies - one his wife, the other his girlfriend – who spent the time arguing with each other and tending to the stricken guy. I later learned that one of these ladies had aggressively inserted a steak knife into the guy’s chest. I never worked out which one was the perp. But with all of the apologizing going on, I actually think he was enjoying the attention. On another gurney, accompanied by his wife, was a rotund gent who kept moaning “I’m having a heart attack” over and over again. Occasionally, a nurse came in and disdainfully told him “relax, you’re not having a heart attack”. Other patients (myself included) were getting tired of this. Around 1 am, I was bandaged up and more than ready to get out of the ER. A friend of mine had been able to make it to the hospital so I was cleared for discharge. Still very light-headed, I knew I wasn’t right but they let me go. As we walked down the hall to the exit, my friend saw I was bleeding down my leg. Later, it transpired that the knife had nicked a blood vessel, which was also why my blood pressure never returned to normal. But they were going to let me out. Back I went to the holding pen where Mr. I’m-Having-a-Heart-Attack was still going strong. The doctors decided they had to admit me but the hospital was so busy there were no beds. Which is why it wasn’t until 4 am that I made it to the ward. I often wonder what happened to the person who vacated that bed in the middle of the night. Through the central door, the ward extended to the left and right; it was entirely dark except for a single beam of light focused on the prisoner cuffed to the gurney, the two cops keeping watch over him in the night. It was like the baby Jesus in the manger . . . only different. 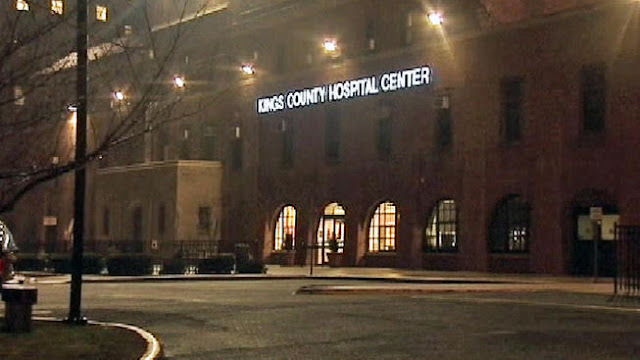 In addition to my other troubles, I had the misfortune to arrive in Kings Country on a Friday: It was determined I’d need a minor operation to fix the blood vessel (at first they thought it would “fix itself”) but there were no surgeons available until Monday. The weekend came and went. Monday came and went. My slippers got blacker and blacker. But the surgeon finally performed the fix on Tuesday. By this time my parents had flown in from the UK and, boy, were they surprised. The only part of Brooklyn they had ever seen flashed by on the way in from JFK. I didn’t eat the entire time I was in the hospital. On Saturday, a nurse came by with dinner--the whole offering was an unappetizing shade of brown. The tray, the food, the plates. It looked horrible. I declined and, for some inexplicable reason, the nurse said “I’ll put it over here in case you want it later.” She popped the entire tray full of food in the drawer of the nightstand. On Tuesday, another nurse found it and wondered what the hell it was doing in there. By then, it just looked like a brown sculpture. Was I happy to get out of there! Violence in NY in the late 1980s was far more common than it is today but, even then, it didn’t seem as if it could possibly affect a white, middle-class, budding corporate exec. There was a sense of unreality about the whole experience, in spite of all the very real, shocking things that happened. My life jolted out of the norm but, within a few weeks of the event, the impact began to dissipate. I found it interesting that my parents heard stories from their friends about similar things happening to their kids. None as extreme as my version, but the casual crime and violence was very prevalent at the time. What I recall most is the arbitrariness of the violence: The guy next to me robbed for a quarter and a subway token . . . stuck in the hospital for weeks. As I had started at Macmillan just that week I had no health insurance. Someone I knew mentioned an agency called the Crime Victims Review Board which would reimburse victims for lost wages, costs and bills. This turned out to be such a useful resource: My hospital bed cost $825 per day and I was in there for five days. The bill for the ambulance arrived by mail before I was even discharged. But Crime Victims paid for all of it. After getting out of Kings County, I spent the next five days in a suite at the Barclay Intercontinental (my father’s employer) so it kind of evened out. I had landed the job at Macmillan with the help of a classmate from Georgetown who was already working there. There was a developing relationship and we had been planning to have brunch on the Sunday following the incident. She was unaware of what had happened and had been leaving increasingly obnoxious messages on my answer phone when I didn’t return her calls. That turned out okay though. I remind her occasionally things could have been worse. She edits my stuff now. Not a lot of people know this story. 30 years ago. From their press release and interesting announcement from Harvard Business Publishing. Harvard Business Publishing Corporate Learning and Degreed today announced a partnership to help organizations address their most critical talent development and skill gaps through a personalized, learner-driven solution. The next release of Harvard ManageMentor® Spark™ brings together world-class leadership and management expertise with an industry-leading learning platform to help organizations foster a culture of continuous workforce learning. Harvard ManageMentor Spark provides employees with a personalized, learner-driven experience that allows them to explore their interests and develop their skills to keep pace with the ever-changing business world. Harvard also has a blog post discussing the fundamentals of personalized learning as they relate to this announcement. Post. Three macro-economic changes facing traditional publishers will help open up a market of 200 million potential students far beyond their existing markets. Expanding their reach beyond college level students to employer-based education, certification and life long learning programs relies on existing competencies but also presents significant operational and strategic challenges. The rewards will be considerable. From the FT, reporting on a report published by the UK Government on internet competition. Professor Furman said: “The focus should be doing what we can to increase competition, not to punish incumbents, but make it easier for new companies to enter the market.” “This is a report for the UK and the option of breaking up Google, for example, is not a policy option for the UK,” he added, stressing that at this stage the emphasis should be on changing the behaviour of tech giants. The central suggestion in the report is to force companies to release their stranglehold on data, which enhances their ability to develop artificial intelligence and prevents start-ups competing for business on a level playing field. The data held was often more valuable to tech companies than the services provided free to customers and the lack of competition allowed tech giants to avoid both paying users for their data and taking adequate steps to keep it secure. We believe the standard tools of competition policy, evaluating whether mergers can proceed and whether antitrust action is warranted to remedy abuses by companies, can play a role in helping to promote competition and the associated better outcomes for consumers and innovation. To do so, competition policy will need to be updated to address the novel challenges posed by the digital economy. Some of these updates can happen within current powers, but legal changes are important to ensure that this job can be done effectively.The biggest gains, however, will come from going beyond these tools to focus on policies that actively promote competition, foster entry by new competitors, and benefit consumers. This will entail a code of conduct for the most significant digital platforms, measures to promote data mobility and systems with open standards, and expanding data openness. By working with businesses and other stakeholders to set up predictable rules in advance, this can create a regime that allows competition and innovation to thrive. You should buy this report if you need insight in to the market and the primary competitors, you are an investor looking for new client relationships and MOST IMPORTANTLY if you are a publisher looking to invest in new and/or replacement solutions to support your business. This report is published on February 25th and we are offering a pre-pub purchase discount price of $995. This price will go up to the full price of $1500.00 on March 8th. The 2019 report is more comprehensive than the 2018 report and offers more detailed insight into the companies and products reviewed. Similar to the 2018 report, we cover software providers offering Enterprise Resource Planning (ERP) applications such as Product Data Management, Editorial and Production Planning, Order to Cash and Contracts Rights and Royalties and we cover Content Management Systems (CMS) which provide content hosting, distribution, ecommerce and access and entitlement solutions. We also contribute analysis on the companies profiled and trends in the industry. In this 90 page report, we have identified over 100 software companies in our market map which cover segments including ERP, CMS, Title Management, Contract Rights and Royalties, Editorial Services, Membership Management, Digital Asset Management, Digital Asset Distribution, Intellectual Property Management and Content Analytics. EACH REPORT PURCHASE WILL ALSO RECEIVE TWO HOURS OF CONSULTING TIME TO REVIEW THE REPORT AND ANSWER DETAILED QUESTIONS. In this report we also discuss the technology the vendors actually use and the investments they are making to improve their platforms - particularly in the area of SaaS and API development. As a buyer of these solutions it is important that there is an awareness and appreciation of how 'future proof' are these applications.